Your Mortgage Girl! "Mortgage Options . . . NOT . . . Restrictions! : Question:Do I need to get Pre Approved for a mortgage? Question:Do I need to get Pre Approved for a mortgage? Question: Do I need to get Pre-Approved for a mortgage? Short Answer: YES!!!!!!!!!!!!!!!!!!!!!!!!!!!!!!!!!! I can't stress it enough, YES, YES, YES! I work with new clients every week and a large percentage are shopping for homes or have written an offer to purchase on a home and don't know what they are pre approved for. YIKES.... put on the brakes - the first steps to purchasing a home should always be a proper pre approval from Amy Wilson, yourmortgagegirl! There are many different types of mortgages available that come with different rates and rate holds. Each mortgage product varies from the amount of money needed down to the qualifying debt to income ratios. Income comes in all varieties, casual, part time, full time hourly, full time salary, commission, commission plus hourly, retirement, self employment, contract, disability etc. Lenders qualify your income differently depending on how you earn your income. 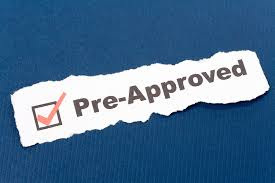 In a pre approval you will provide paperwork to your broker to determine how much income can be used to qualify for your home purchase. Down Payment has specific paperwork requirements tied to it, that can hold up an approval or funding, better to find out before you go home shopping! Many of my clients are getting declined to purchase a home they have all ready emotionally attached to because they didn't get the pre approval first - Pre approvals will eliminate disappointment! Some lenders will give you a predication of how much you qualify for based on a paystub and answering a few questions, I strongly recommend you don't use this method. with Amy Wilson, yourmortgagegirl and provide paperwork so you can be confident when you go to buy a home. Time frame - you should get pre approved as soon as you are even thinking of buying a home - why? 1. Confidence when you start shopping, you won't face disappointment of the unknown credit check. 3. Correct Potential Credit Problems: If you credit issues that need to be fixed, we can address them prior to a looming deadline. 5.If there were multiple offers, you will be ahead of the other offers as your pre approval is in place, no pressure deadlines. 6. Once you make an offer on a home, you can get an approval quicker with no hassles or surprises, reducing stress!